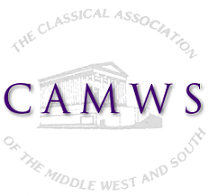 The Subcommittee on the CAMWS First Book Award asks for your help in identifying distinguished first scholarly books (or digital equivalents) in the field of classical studies (including, but not limited to, the languages, literatures, history, religions, philosophy, art, architecture, archaeology, economy, and reception of Greek and Roman antiquity) published by CAMWS members in 2016, 2017, or 2018. Self-nominations are encouraged. Please note that nominated authors must be members of the Association in good standing and for at least the previous year and that CAMWS has a separate award for pedagogical books (see Bolchazy Book Award). In the case of co-authored books, all authors must meet "first book" and membership eligibility requirements. Please send nominations, including titles and publishing information, to the committee chair by email (firstbook@camws.org). The Committee will close its list for the 2019 award on September 1, 2018. Books published after that date may be considered for the 2020 award. All other factors being equal, the committee is looking for something that shifts the conversation substantially in the area covered by the book. Recipients are encouraged to accept this award in person at the annual CAMWS business meeting.